Tag line: "A Science Fantasy Adventure." A good movie draws you into the world it creates. That Quest for Fire achieves this does not, in itself, make it a unique motion picture. The fact it’s set eighty thousand years in the past does. 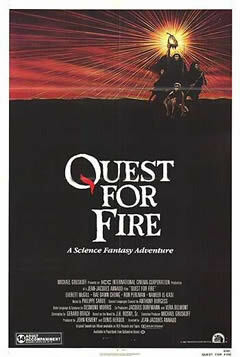 Quest for Fire is the story of a prehistoric tribe that, like all others in its primitive society, needs fire to survive. When their only source is accidentally extinguished, three members of the tribe (Everett McGill, Ron Perlman and Nameer El-Kadi) embark on a journey to bring back more. On their travels, they meet up with a strange woman named Ika (Rae Dawn Chong), a member of an advanced tribe that's already mastered fire. With her as their guide, the three discover the secret of fire, and much more besides. The most basic of human emotions, i.e: fear, anger, and desire, have their roots in man's primitive past, and Quest for Fire effectively exhibits each of them. Yet there are deeper things at play here as well. In essence, Quest for Fire provides a glimpse into the beginnings of mankind as a sentient being, slowly becoming aware of its own possibilities. At one point, we even bear witness to what might be history's first instance of self-defined morality. After going days without food, the three main characters stumble upon the remains of another tribe’s feast, and begin gnawing on the bones left behind. Suddenly, one of them lifts up a human skull, and all three realize the “feast” they’re scavenging from is the leftovers of cannibals. They spit the “food” onto the ground in disgust. In that moment, the primary urge of hunger was overtaken by their values, their personal feelings of right and wrong. Obviously the tribe that was there earlier had no qualms about eating human flesh, thus giving us an early example of conflicting societal mores. With moments such as these (which also extend to the exploration of love in a monogamous form), Quest for Fire takes on a deeper purpose, far beyond that of a simple tale of early man. It reveals mankind at a crossroads, uncovering the social and emotional struggles that will hamper its existence for thousands of years. I admit I was skeptical going into Quest for Fire; despite the critical praise it received over the years, I didn’t see how a film on prehistoric man could possibly work, especially one that took a narrative, as opposed to a documentary, approach. Even films that relied heavily on their visuals, like 2001: A Space Odyssey, at least had dialogue (however limited) to fall back on. With Quest for Fire, no words would be possible because the film is set thousands of years before the advent of language, or at least language as it's existed for centuries. I wondered: would I even know what’s going on? As it turns out, my concerns were unfounded, and, admittedly, a little naive. With masterful performances from all the principles, and perfectly paced direction that never falters, Quest for Fire kept me in tune with its story, and did so in a way that was entirely satisfying. Quest for Fire is a remarkable achievement; it is a film to watch in stunned silence. I have a soft spot for this film, despite the many dubious evolutionary statements which are made - in what is otherwise a fascinating film - especially considering the lack of dialogue. Klaus: You should so that...it sounds like it would be an interesting exercise (man, wish I had you as a professor! ).